For most of my life I’ve celebrated Christmas like most people in America: cookies, cards and gifts, wrapping paper and the tree. As a kid, it was all about what I was going to get. I had no idea what the celebration was really all about. As I got older I began to wonder why we all had to go through this incredibly stressful and expensive ritual. Now, for the past 10 years I’ve really tried to step away from the commercial hype and try to celebrate the season in a more personal way. It’s hard to do when everyone else is so caught up in the rituals. I’ve never been comfortable with rituals and with doing things the way everyone says I should. I’ve gone along but I haven’t liked it. Instead of buying presents for everyone I usually donate to a food bank or something. Now, at 50, I’m finally doing what I want to do. And what I want to do is celebrate the Solstice. I just don’t know how! I’ve always been attracted to the Summer and Winter Solstice and I don’t really know why. The Summer Solstice starts on June 21, which is the first day of the Cancer sun sign, and I’m a Cancer. I’ve always been attracted to Sun energy, and this past summer Stevo and I started to do safe sungazing with pretty amazing results. 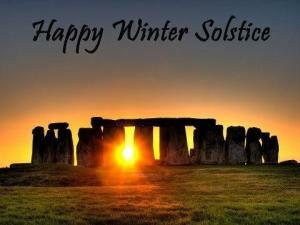 The Winter Solstice is supposed to be a celebration of the coming of Spring. The sun will be shining longer and longer each day after December 21st. It’s a celebration of coming out of darkness and into the light. I can get behind that! So I want to create some traditions. Stevo and I were going to have a big bonfire on the 21st but it was so rainy and wet here that we knew it wouldn’t work. My sister sent me a Rosemary tree with little lights on it, and I’m using that as a kind of celebration of light with herbs…kind of cool. I’ve been looking it up on the web to find what other folks do for the Solstice but I haven’t found anything that resonates with me yet. Carol celebrates the Solstice instead of Christmas, so the next time I get together with her I’ll be sure to quiz her. It’s a bit daunting to find your own traditions when you are pretty much going against the grain of your society, but Stevo and I have always be iconoclasts so it won’t really be any different from gifting orgonite and doing energy work, right? I do celebrate the birth of Jesus in my heart, but since historians can’t agree on when he was born I don’t feel particularly attached to December 25th except as a family and societal ritual. Stevo and I give thanks every day for Jesus, God, the Universe and whomever else is out there helping us: dolphins, wingmakers and other entities. We wouldn’t be able to do the work we do without the help of all our etheric friends. Happy Solstice! If you celebrate Solstice, let me know how you do it. My grandmother died recently, the second close member of my family to die in the past 18 months, and I’ve had to deal with a lot of grief. Amidst making travel plans and funeral plans, and comforting other family members, it’s easy to forget to do the basics. I’ve had to remind myself to ground, to makes sure each chakra is open, and to bring golden suns into my body. One day I really couldn’t do the whole program, so I just simply imagined the suns coming into my 3rd chakra, over and over. After about 10 minutes I was able to ground, make a new grounding cord and check in with each chakra. Sometimes all you can do is bring energy in, and that’s okay. Start with that, then the rest will happen when you are ready. The other thing I learned is that you really can’t hold back the grief, you have to let it out. When I was traveling to see my dad for the last time, I held it in because I didn’t want to cry in front of everyone in the airport and on the plane. Well, I just about lost my breakfast and then had a mini-panic attack in the airport. After that, I just cried and I didn’t care who saw, and I felt so much better. People understand, and if they don’t it doesn’t matter one bit. You can deal with fear the same way, which I think I wrote about this summer. Bring golden suns into your 3rd chakra until you can deal with whatever has put you into fear. The important thing is to not become frozen with it. Keep your energy moving in any way that you can. Then you will get to a point where you can move forward. The other thing to remember is that if you can get yourself out of the grief energy a bit, you’ll be able to help other people who are not as aware of energy to keep their heads above water too. By working on your own energy, your calmness and strength will rub off on everyone else and that will make is easier for them to get through a tough time. You will also be better able to boost other people. I also realize that it may be nearly impossible to do all of this if you lose a spouse or a child, neither of which I have ever experienced. Just do the best you can, and hopefully you’ll have someone else there who can remind you to breathe. The other night I couldn’t sleep and I was thinking about my grandma, and I got an image of her in my head. She was about 40, wearing a flowered dress and white gloves and she was waving at me. Then I saw her at about 20 years of age and she was riding a horse. She looked happy. She was 94 and I know she was ready to go because she said as much to my cousin a few weeks before she died. It made me happy to think she was probably with her first husband, a grandfather I never got to meet. Souls move on, and that’s okay. Those of us who are left behind grieve, and that’s okay too. I find myself becoming more and more cynical about holidays like Thanksgiving and Christmas, Valentine’s Day and all the made-up holidays in between. I keep wondering…why can’t people give thanks all the time? Why do we have to wait until Christmas to be nice to each other and help those in need? Why wait until February 14th to show someone you love them? And why do we celebrate people like Columbus, who committed genocide? One thing that has really changed my perspective on the world, besides orgonite, is gratitude. Stevo and I give thanks every day, just because we are alive. The other day I was walking around outside, smelling the fresh air, looking at the blue sky and I felt so much joy just because I’m in a body on Earth. I went back in and said to Stevo “no wonder so many beings want to come to Earth and be in a body.” Sometimes life is so beautiful and precious, you don’t want to waste one minute being anything but joyful. I think the key is to remember times when you feel like that, so that when the hard times come you will be able to withstand whatever happens. It’s the same with energy work, too. If you keep your energy system strong you can withstand the battering ram of negative energy that flies around the Earth. Those of us who are doing the energy work are anchors of light on the planet and we’re beacons of light too. We’re standing strong and firm on the Earth, so that anyone else who wakes up will have somewhere to go for help. If you’re doing the energy work on yourself and sending out Love, you are one of those anchors. I am so grateful that I have the ability and opportunity to help people become an anchor through my coaching work. And as frustrated as I sometimes get with the PJ people out there, I’m grateful for them too. They are the reason we do this work. They have hearts and an incredible capacity for Love, if they would just wake up. I see more and more folks waking up all the time, so I have a lot of hope. It’s no use going into despair. I’ve been there and it wasn’t a good place to be. So my advice is to give thanks….and don’t give up! I can’t believe it’s been more than a month since I last posted here. Time goes by so fast I just can’t keep track anymore. I’ve been busy with 3D life and also trying to integrate my new awareness of energy into that life. I also had to make an emergency trip to help my mom, who was ill, deal with my grandpa and grandma, both of whom ended up in the hospital at the same time. Now there is another world. The hospital. I’ve managed to mostly avoid hospitals my whole life. The hospital my grandparents were in is the same hospital where my dad died last year, so that was hard to take. I had to use all my recent energetic training to get on a plane, get to my grandparents’ house then spend the next six days in the hospital running from one room to the other, keeping everyone updated on my grandparents’ condition, quizzing the doctors and nurses and making sure my mom didn’t slide from bronchitis into pneumonia. Can you say GROUNDING? I grounded so many times I was pretty much just running my energy all the time. And amazingly, I did pretty well. I didn’t get sick with the cold/bronchitis that everyone else had and I didn’t just crash from the stress. I managed to step up to the plate and make sure the doctors didn’t kill my grandparents. My grandma was released after just four days, and my grandpa is now in rehab getting his strength back so he can go home. The tests just keep on coming and this was a big one. For me to leave my home is like blasting a crab out of it’s shell. I like it here. I feel safe here (except when the NSA invades in secret). But, I was able to do it without too much angst. Like I said, I just keep running my energy and being aware of what was in my space. I was able to do some energy boosting for my mom and grandparents to help them overcome their illnesses. It was like being in a parallel universe, and I talked to Stevo each night to remind myself that my universe still existed in Montana. It’s really hard to be out there in the world at large. Sometimes it’s good to stretch your boundaries, though, and learn to handle your energy in the face of more difficult circumstances. Having said that, though, I am so glad to be home! Things have settled down in my house quite a bit in the last week. They aren’t attacking me anymore…finally! I do expect more attacks, however, so I am continuing to do the daily work of grounding, boosting my chakras, sungazing, looking at fear pictures and getting rid of them, etc. I have been forced to move to a new level of awareness and vigilance, but it’s all good. Good things are coming to us because we are both allowing for the possibility of bad things, but not dwelling on it. I find I have more conviction, more courage, finer-tuned psychic abilities, and more of a “go with the flow” attitude. I give thanks to my Creator every day. I am so lucky and so blessed. I am living much more in the present instead of the past (guilt) or the future (fear). My last post was really long (sorry) and I didn’t get a chance to put all my thoughts in, so here’s another postmortem. • I am relying a lot on my Grounding and my 3rd Chakra Rescue bracelets. I either wear them on my wrist or lay them directly on my 3rd chakra. I ask the stones to help protect the chakra. It’s helped. [Edit] After I wrote this I talked to Carol to get some help in figuring out how to stop them from getting into my 3rd chakra so deeply every morning. She told me to put her Crystal Harmonizer right on my 3rd chakra as much as possible. I took it to bed with me and as soon as I woke up the next morning, I felt the attack. I had fallen asleep holding the Crystal Harmonizer in my hand, and I could feel energy hitting it. I immediately put it on my 3rd chakra, and I could almost see the attack energy hitting the top and scattering. The attack couldn’t reach my 3rd chakra! I had to spend maybe 15 minutes this morning (July 8) getting rid of my attackers, so it was a much improved experience. Thank you Carol! • I’m relying a lot on dowsing to get answers. I didn’t used to dowse a lot because I didn’t feel I was clear enough to get accurate answers. It’s been getting easier over the years, especially when I hold a Lemurian SP in my left hand while dowsing with the right. This was Don Croft’s idea, and he calls it Turbo-Dowsing. I also have been using one of the Merkaba pendulums that Carol sells on her site (the rose quartz one) and it is definitely more accurate. I highly recommend getting one if you are into dowsing. I also sometimes hold my Herkimer diamond to dowse, as it is a stone for clearing your energy. The clearer and more neutral you are, the more accurate your dowsing will be. I’ve had a humbling lesson this past week, just when I thought we had our last severe attack figured out (see the post before this one). Turns out that was nothing compared to what I’m going through now. Since July 1 I have been undergoing the most severe attack on me personally, specifically my 3rd chakra, that I have ever experienced. They got to me by threatening Stevo, naturally, and got into my 3rd chakra so completely that I was a basket case of fear for about 48 hours. Looking back on those first two days now, it’s easy to say “oh yeah, I should have done such-and-such”, but let me tell you, when I was in the middle of it, it felt like the end of the world. Don’s email account has been cut off by the jerks at Wildblue, so I gave him an account on my DonebyDooney domain. You can reach him at doncroft@donebydooney.com. This is part of the ongoing attacks on Don and Carol, and this one is specifically to shut down his business. Don and Carol are on the road now, as Don has posted about on EthericWarriors.com. We are doing once-a-week and sometimes twice-a-week boosting sessions to help out this situation and bring about the best possible outcome for Don and Carol. We have a little joke that our coffee grinder is psychic and knows just how much coffee to grind on any given day. It’s always set at the same amount, but some days it grinds a little more than normal, some days a little less. I think the grinder knows when we need a little extra jolt. Stevo and I don’t go to the movies anymore, since the movie theater experience can be a bit much for two energy sensitives. Luckily, there’s Netflix and our local video store, the latter which unfortunately tends to stock slasher movies and Mormon love stories. We tend to look for movies that have some kind of spiritual growth or message of love or hope. It’s just not worth our time to endure the majority of movies that focus on hate, horror and negativity – there’s enough of that in the world already. We have an agreement that either one of us can nix a movie choice once we’ve started watching. Life is too short to endure a bad movie.